IT'S GORGEOUS DOWN here at Fifth and Maine, and we are ready for another rock and roll weekend. Start up the truck and let's go! At 11:30 this morning, Blake Gardner plays for our Noon Blues show in Washington Park. Tonight's Blues In The District features Catfish Willie and starts at 5:30. After the show, continue your blues fix with the Matt Roberts Blues Band at The Club Tavern on North 10th. 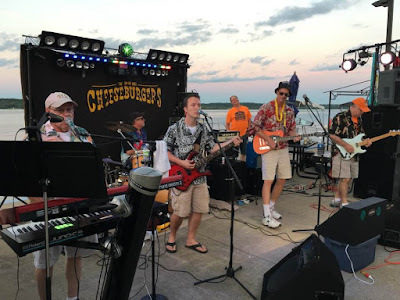 Saturday night, The Cheeseburgers start our 2017 Summer Make America Cheesey Again Tour at the Party Cove in Monroe City, 8 bells is the kickoff. And Sunday at 2 p.m., Cori Lyssy and I return to our favorite Hannibal haunt, La Azotea, to hang out with April and the crew in the patio. Sunday night I'll go to bed and hopefully wake up Tuesday or Wednesday, and let you know how it all went.